Home Chinchillas Do Chinchillas Like To Be Held? Welcome to our complete guide to handling chinchillas! Giving you the information you need about interacting with chinchillas. Along with the answer to that all important question – do chinchillas like to be held? We’ll help you to understand when a chinchilla might want to cuddle, how to pick one up and how to train a chinchilla to be held too. Chinchillas are cute and furry little rodents that can make good pets for some people. They are crepuscular, meaning they are inactive during the day and quite active at night. A chinchilla’s temperament is largely innate and likely to be a reflection of their parents’ personalities. So be extra vigilant about choosing the right chinchilla for you. To find the chinchilla with the right temperament, it is recommended that you go to a chinchilla breeder rather than a pet store. Reputable chinchilla breeders are a better place to purchase your pet for several reasons. One of the most important reasons is they tend to be highly selective when choosing mating pairs. Thoughtful chinchilla breeders will choose two gentle, good-natured chinchillas to breed together. In order to increase the likelihood of producing nice chinchilla kits (babies). 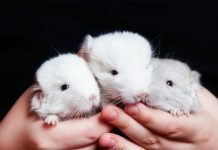 Another reason to choose a reputable breeder is that they know how to care for and handle baby chinchillas. Baby chinchillas need to be held and touched regularly in order to acclimate to humans. This will ensure that your chinchilla will be better at responding to you. You are unlikely to find this kind of special attention in a pet store. So you can probably tell that the answer to ‘do chinchillas like to held’ is not a simple one. Some chinchillas like to be held, and others do not. It really depends on the individual chinchilla. A chinchilla from friendly parents who has been handled since it was born will be happy to be held. One that has missed that important socialization will be far less keen. So, do chinchillas like to be held as babies? Yes, but it’s important to do so carefully. When holding a chinchilla, place its hind legs on your hands and its front legs against your body, rather than just in your outstretched hands. This offers more stability for the chinchilla, making it feel safe. Some chinchillas tend to be a bit high-strung, so it is best that young children do not handle them. A frightened chinchilla may act aggressively our of fear, and you could risk being bitten if you are rough or scare them. Even rough handling by adults can lead to bites. If a child does want to hold a chinchilla, be sure to show him how to hold a chinchilla correctly. Make sure the child is gentle with the chinchilla and keep a watchful eye. Do Chinchillas Like To Cuddle? It is rare that a chinchilla likes to cuddle with people. They aren’t lap-pets for the most part. Most of the time, they prefer to explore! And isn’t that fun! During playtime, they would rather run around and climb all over you than be still. Chinchillas in general are fun and lively pets, and very entertaining. But occasionally you will get one that likes to snuggle up to you. The best time to see if a chinchilla will like to cuddle is after its weaned from its mother, at about 8 weeks. It will miss the company of its mother and naturally want to bond with someone. That someone could be you! So you have a chinchilla who likes to be held? But how should you approach this action? The best way to pick up a chinchilla is to slowly approach the chinchilla with outstretched hands. Be calm and patient. The chinchilla will sniff your hands. With both hands outstretched, reach for its torso. With one hand on the torso, use your other hand to hold up its legs. Gently hold the chinchilla against your chest and let its feet rest against you. This is much better than letting its feet dangle in the air. Hold your pet gently but firmly, as they tend to wriggle and easily get loose. Pay special attention and be cautious. You do not want your pet to fall from a great height, because they can easily get injured. Equally you don’t want to squeeze too hard and hurt them. It might take a bit of practice. When you pick up your baby chinchilla ask the breeder to show you the best way to handle them. Although chinchillas normally prefer not to be held, there will be times when it is necessary to do so. 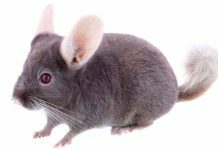 Good reasons for chinchilla holding include developing a stronger bond with your pet and also training him to get used to exams at the vet’s office. Start with short sessions of holding. Pick up your chinchilla gently but firmly and hold him against your chest. Then put him back in his cage. 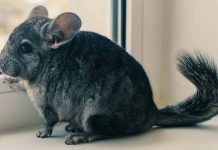 You don’t want to overwhelm your chinchilla with holding him for too long in the beginning, or you might turn him off from being held altogether. To train a chinchilla to be held requires patience. You can start by calmly putting your hands in its cage. Just let it sniff you for a while. If all is well, gently pick up the chinchilla by its torso for a few seconds. Then set it down. Give your pet a treat for being so kind enough to let you pick him up to begin with. The next time you do this, follow the above steps and hold him up for longer. Follow this with another treat. You are rewarding your pet for allowing you to pick him up. Follow the above steps for how to hold a chinchilla properly. Keep rewarding your chinchilla with a treat each time you do this. You are increasing your chances of your chinchilla looking forward to getting picked up and held, which is a good thing. Most chinchillas would rather be playing and exploring than being cuddled. But some will be happy to have a hug on occasions. Choosing a baby from a good breeder who has picked friendly parents and handled him from birth is a great way to get a chinchilla who does like to be held. If your chinchilla isn’t keen on being picked up, with careful, slow and rewarding practice you may be able to get him used to it. Do chinchillas like to be held at your house? Do you have a pet chinchilla that enjoys being held and cuddled? Was it innate, or did it require training? Let us know how you accomplished this. We would love to hear your thoughts in our comments section below!